Predators are just a natural part of the cycle of life. Even though we are raising a bunch of prey here, I have been enjoying watching a lone coyote come and catch breakfast in our back field furthest away from our barn. He is fascinating to watch. He is still as a statute, listening and watch for the tiniest sound or movement under the snow. Then he leaps and pounces on the cold unsuspecting vermin. He does this over and over again until he fills his stomach. He looks absolutely joyful when he pounces. I don’t know why I’m surprised that they look just like a pet. Like a dog when they are playing their favorite game. Every once in a while he would glance up toward me with a wary look. It made me feel like he knew it wasn’t safe to come any closer. I was totally immersed in enjoying this glimpse into nature when Dean reminded me that he is a predator. And we really need to do something to make sure the coyote doesn’t feel welcome here. He suggested shooting it. He pointed out that just last week we had a chicken mysteriously vanish without a trace. I intervened on behalf of this beautiful predator and suggested we just have our dog Chia bark at him. I was convinced that just opening the door would send him off, frightened, into the woods. But no, Chia’s barking did not scare him away, he barely looked up. Not until I banged on the window did he leave his potential breakfast behind and moped up the field stopping at the edge and looking back to assess the situation. It took another knock on the window and he disappeared into the woods. 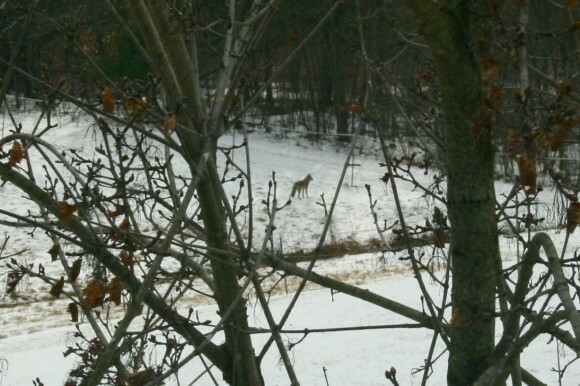 What’s worse than have one predator thinking your farm is a good place for breakfast? Two! This coyote brought a larger friend here for breakfast the very next day. This second coyote was even bolder and defiant than the first. He ventured even closer to the house without any fear of being so close. I now realized Dean was right and something needed to be done. I texted my my favorite son -in- law and he scared them away this time. I don’t know how long they will stay away. So i will be locking the prey, our chickens safely in when I’m not home. Hopefully we won’t be seeing them again anytime soon. Posted by Maryclaire Mayes on Friday, January 27th, 2017 at 14:04 and is filed under General.